منافی آذر, علی, خامه چیان, ماشااله, ندیری, عطااله. (1397). بهینه سازی روش ALPRIFT با استفاده از ماشین بردار پشتیبان (SVM) برای ارزیابی آسیب‌پذیری فرونشست دشت جنوب‌غربی تهران. نشریه انجمن زمین شناسی مهندسی ایران, 11(2), 1-14. علی منافی آذر; ماشااله خامه چیان; عطااله ندیری. "بهینه سازی روش ALPRIFT با استفاده از ماشین بردار پشتیبان (SVM) برای ارزیابی آسیب‌پذیری فرونشست دشت جنوب‌غربی تهران". نشریه انجمن زمین شناسی مهندسی ایران, 11, 2, 1397, 1-14. منافی آذر, علی, خامه چیان, ماشااله, ندیری, عطااله. (1397). 'بهینه سازی روش ALPRIFT با استفاده از ماشین بردار پشتیبان (SVM) برای ارزیابی آسیب‌پذیری فرونشست دشت جنوب‌غربی تهران', نشریه انجمن زمین شناسی مهندسی ایران, 11(2), pp. 1-14. منافی آذر, علی, خامه چیان, ماشااله, ندیری, عطااله. بهینه سازی روش ALPRIFT با استفاده از ماشین بردار پشتیبان (SVM) برای ارزیابی آسیب‌پذیری فرونشست دشت جنوب‌غربی تهران. نشریه انجمن زمین شناسی مهندسی ایران, 1397; 11(2): 1-14. با توجه به افزایش جمعیت و توسعه فعالیت‌های کشاورزی در دشت جنوب‌غربی تهران که سبب افزایش برداشت آب‌های زیرزمینی شده، ارزیابی پتانسیل آسیب‌پذیری مناطق دارای فرونشست اهمیت زیادی دارد. در این پژوهش آسیب‌پذیری دشت جنوب‌غربی تهران در برابر فرونشست به کمک روش ALPRIFT در محیط ArcGIS بررسی شده و بهینه سازی روش ALPRIFT با استفاده از مدل‌های ماشین بردار پشتیبان (SVM) صورت گرفته است. برای اجرای روش ALPRIFT از پارامترهای موثر در ارزیابی آسیب‌پذیری فرونشست شامل جنس محیط، کاربری زمین، میزان پمپاژ آب زیرزمینی، میزان تغذیه، ضخامت آبخوان، فاصله از گسل و افت سطح آب زیرزمینی استفاده شده که به صورت هفت لایه جداگانه رتبه دهی و وزن دهی شده و از تلفیق این هفت لایه، شاخص ALPRIFT محاسبه شد که بر اساس نتایج بدست آمده 173-77 برآورد شد. به منظور بهینه‌سازی روش ALPRIFT از مدل SVM استفاده شد. برای صحت سنجی نتایج از نقشه ماهواره‌ای InSAR و ضریب همبستگی (R^2) آن با شاخص آسیب‌پذیری و شاخص همبستگی (CI) پیزومترهای موجود در دشت استفاده شد. Considering the increase in population and the development of agricultural activities in the south-western plain of Tehran, which has led to an increase in underground water drainage, the assessment of the vulnerability of subsidence areas is of great importance. In this research, the vulnerability of south-western plain of Tehran to subsidence has been investigated using ALPRIFT method in ArcGIS and optimization of the ALPRIFT method has been performed using SVM. To implement the ALPRIFT method, effective parameters have been used to assess the subsidence susceptibility including aquifer media, land use, groundwater pumping, recharge, aquifer thickness, faults distance and groundwater decline, which are ranked in seven separate layers and Weighted the ALPRIFT index from the combination of these seven layers, which was estimated to be 173-77. In order to optimize the ALPRIFT method, the SVM model was used. For this purpose, the input data (ALPRIFT parameters) and output (vulnerability index) and the subsidence amount were related to the two groups of training and testing. After training the model, Using the subsidence amount, the model results were evaluated at the experimental stage. The results showed that the SVM model was able to improve the results of the original ALPRIFT method. In order to verify the results, the InSAR radar map and its correlation coefficient (R^2) with the vulnerability index and correlation index (CI) of the piezometers in the plain were used. Amighpey, M., Arabi, S., Talebi, A., Djamour, Y., 2006. Elevation Changes of the Precise Leveling Tracks in the Iran Leveling Network. Scientific Report Published in National Cartographic Center (NCC) of Iran. Daley, D., Drew, D., 1999. Irish methodologies for karst aquifer protection. In: Beek B, editor. Hydrogeology and engineering geology of sinkholes and karst. Rotterdam: Balkema. p. 267–72. Dixon, B., 2005a. Applicability of neuro-fuzzy techniques in predicting groundwater vulnerability: a GIS-based sensitivity analysis. Journal of Hydrology, 309(1–4): 17–38. Dixon, B., 2005b. Groundwater vulnerability mapping: a GIS and fuzzy rule based integrated tool. Journal of Applied Geography, 25: 327–347. Dixon, B., 2009. A case study using support vector machines, neural networks and logistic regression in a GIS to identify wells contaminated with NO3-N. Hydrogeology Journal, 17: 1507–1520. Ebtehaj, I., Bonakdari, H., Shamshirband S, Mohammadi, K., 2016. A combined support vector machine-wavelet transform model for prediction of sediment transport in sewer. Flow Measurement and Instrumentation, 47: 19–27. Ferreira, C., 2001. Gene expression programming in problem solving, In: 6th Online World Conference on Soft computing in Industrial Applications (Invited Tutorial). Fijani E, Nadiri A.A, Asghari Moghaddam A, Tsai F, Dixon B., 2013. 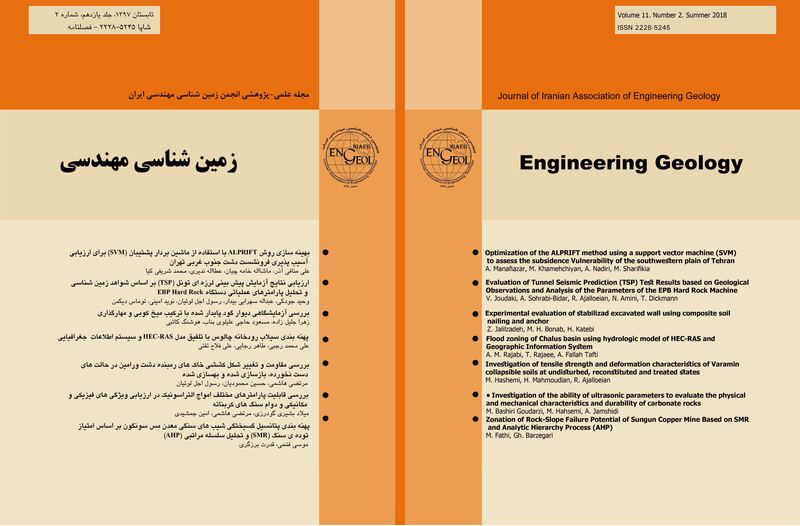 Optimization of DRASTIC Method by Supervised Committee Machine Artificial Intelligence to Assess Groundwater Vulnerability for Maragheh-Bonab Plain Aquifer, Iran. Journal of hydrology, 530: 89-100. Kumar, A.R.S., Sudheer, K.P., Jain, S.K., Agarwal, P.K., 2005. Rainfall-runoff modelling using artificial neural networks: comparison of network types. Hydrological Processes, 19 (6): 1277–1291. Poland, J.F.(Ed. ), 1984. Guidebook to Studies of Land Subsidence due to Ground Water Withdrawal. United Nations Educational. Scientific and Cultural Organization. Paris. Studies and reports in hydrology 40. 305 p.
Salat, R., Osowski, S., 2004. Accurate fault location in the power transmission line using support vector machine approach. Power Systems IEEE Transactions, 19: 879–886. SCI, Statistical Central of Iran, 2016. National Population and Housing Census. www.amar. org.ir. Valverde Ramdrez, M.C., de Campos Velho, H.F., Ferreira, N.J., 2005. Artificial neural network technique for rainfall forecasting applied to the Sao Paulo region. Journal of Hydrology. 301(1): 146–162. Vapnik, V.N., 1995. The Nature of Statistical Learning Theory. Springer, New York, 314 p.
Van Stemproot, D., Evert, L., Wassenaar, L., 1993. Aquifer vulnerability index: a GIS compatible method for groundwater vulnerability mapping. Canadian Water Resources Journal, 18:25–37. Vrba, J., Zaporozec, A., 1994. Guidebook on Mapping Groundwater Vulnerability. International Association of Hydrogeologists (International Contributions to Hydrogeology 16), Verlag Heinz Heise, Hannover. Waltham, A.C., 1989. Ground Subsidence. Chapman & Hall, 202 p.
Younger, P.L., 2007. Groundwater in the Environment, Blackwell, 185p.